A blue moon can refer to either the third full moon in a season with four full moons, or the second full moon in a month. Most years have twelve full moons that occur approximately monthly. In addition to those twelve full lunar cycles, each solar calendar year contains roughly eleven days more than the lunar year of 12 lunations. The extra days accumulate, so every two or three years (7 times in the 19-year Metonic cycle), there is an extra full moon. By the 18th century, before the Gregorian calendar reform, the medieval computus was out of sync with the actual seasons and the moon, and occasionally spring would have begun and a full moon passed a month before the computus put the first spring moon. Thus, the clergy needed to tell the people whether the full moon was the Easter moon or a false one, which they may have called a “betrayer moon” (belewe moon) after which people would have had to continue fasting for another month in accordance with the season of Lent. The moon may appear literally blue when smoke or dust clouds the sky, as after a major forest fire or volcanic eruption — which only happens once in a… never mind. Disaster is rarely as pervasive as it seems from recorded accounts. The fact of being on the record makes it appear continuous and ubiquitous whereas it is more likely to have been sporadic both in time and place. Besides, persistence of the normal is usually greater than the effect of the disturbance, as we know from our own times. After absorbing the news of today, one expects to face a world consisting entirely of strikes, crimes, power failures, broken water mains, stalled trains, school shutdowns, muggers, drug addicts, neo-Nazis, and rapists. The fact is that one can come home in the evening — on a lucky day — without having encountered more than one or two of these phenomena. This has led me to formulate Tuchman’s Law, as follows: “The fact of being reported multiplies the apparent extent of any deplorable development by five- to tenfold” (or any figure the reader would care to supply). People who like to take charge of situations, who respond sympathetically to others, and who have a strong sense of moral and social responsibility are more likely to intervene than people who lack those traits, research shows. Heroes tend by nature to be hopeful, believing events will turn out well. They consciously try to keep fear from hampering their pursuit of goals, and they tend to block out the possibility of injury or material loss. People who are otherwise good and caring may still shrink back in a crisis. Their responses depend partly on whether they perceive the situation as an emergency and whether they know how to help; someone who doesn’t know anything about electrical wiring probably won’t rush to save a person tangled in a power line. How you’re feeling that day makes a difference, too; “people who are in a good mood are more likely to help,” says Julie M. Hupp, an assistant professor of psychology at Ohio State University in Newark. Context also matters; some researchers say a large crowd makes it less likely that an individual hero will step up. Of course, it helps to be physically able. In a 1981 study of 32 people who had intervened to help victims of assaults, robberies or other serious crimes, researchers found the heroes were taller, heavier and more likely to have had training in rescuing people or responding to emergencies than a comparison group of people who hadn’t intervened in a crime or emergency for 10 years. But heroism is far more complex than that. 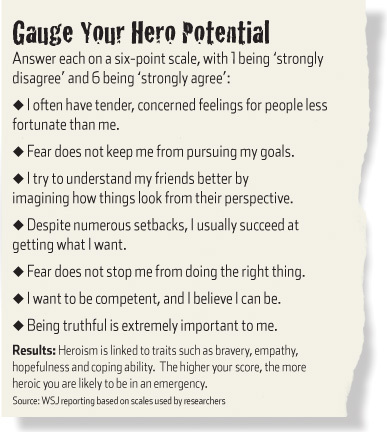 Some heroes have qualities that enable them to blast through obstacles, recent research shows. Empathy, or care or concern for others, runs high in people with heroic tendencies, according to a 2009 study led by Sara Staats, a professor emeritus of psychology at Ohio State University in Newark. Pros swing the way they do and use the equipment they use because they have to. They don’t have time to turn completely sideways and step into the ball with their front feet, so they hit most of their shots with an open stance, with their feet almost facing the net. They can’t afford to hit serves with their feet on the ground, as Evert did, so they propel themselves into the air. They barely have time to get to the net anymore, because the pace of the game is too fast and the passing shots too accurate. They need all the power and topspin they can get, and will sacrifice the feel of gut strings to get it. Recreational players have more modest needs, ones that haven’t changed in decades: Consistent strokes that hit the ball deep in the court, patience, reliable footwork, well-placed serves and strategic acumen. Jazzed up after two weeks of watching high-level tennis nonstop, that’s not what ordinary players want to hear. How much of Guillermo Del Toro’s design DNA is in The Hobbit? [Guillermo] had designed a lot of the movie. I looked at his designs when he took over and a lot of his designs are very Guillermo. It was very much stuff that you would recognize from Pan’s Labyrinth or Hellboy . It was his artistic vision and I couldn’t make that movie. I looked at his designs and I said the only person who can make a Guillermo Del Toro movie is Guillermo. It shouldn’t be me. I can’t put my head into somebody else’s idea. I have to generate it from the beginning. So really I redesigned the film pretty much. Some of Guillermo’s DNA is in there. There were some things he did that I thought were pretty cool and I’ve taken bits of pieces of his stuff, kind of altering it and changing it as I saw it. But the film was largely redesigned. One of the many backstories we learned was about the ongoing struggle between the Flight Operations people who ran Mission Control and Deke Slayton, who managed the astronauts. Senior staff in Flight Operations were of the opinion that some astronauts were better than others, and wanted flight assignments to be made accordingly. Slayton believed just as strongly in a rotation system. Once assignments to the rotation had been made, he was adamantly opposed to making substitutions—it would be insulting to the crew that was displaced and destroy astronaut morale. As a compromise, the rotation for the Apollo flights was set up so that command of the first lunar landing was likely to go to Jim McDivitt or Frank Borman, both of whom were especially esteemed by everyone in the Apollo program. But then came the fire that killed the crew of Apollo 1, which took one crew out of the sequence. Then Apollo 8, the first circumnavigation of the moon, was inserted at a new place in the schedule. And so it came to be that Apollo 11 was the mission that got the first lunar landing and that Neil Armstrong, assigned to Apollo 11 years earlier, was the commander. I once raised this issue with Jerry Bostick, who ran the Flight Dynamics branch during Apollo—the guys in Mission Control who were responsible for getting the spacecraft from point A to point B. Yes, Jerry acknowledged, it was the luck of the draw. But it was a lucky draw for the Apollo program, he thought. Armstrong displayed the same sang froid during Apollo 11, when the Eagle was heading toward a field of boulders and, with a fuel tank within seconds of empty, Armstrong flew the spacecraft to a safe landing spot. And then, back home and after the obligatory ticker-tape parades were completed, he never did anything to cash in on his fame, living out his life quietly, a good man. On a simulated lunar descent, leaking propellant caused a total failure of his flight controls and forced an ejection. His only injury was a hard tongue bite. In his Armstrong biography First Man , author James Hansen recounts how astronaut Alan Bean saw Armstrong that afternoon at his desk in the astronaut office. Bean then heard colleagues in the hall talking about the accident, and asked them, “When did this happen?” About an hour ago, they replied. We then settled down to rest, when suddenly there was an unmistakable shell-burst close outside. I went to the door as the smoke and dust were clearing, and through the Castle gap saw, far out on the plain, four quickly flickering flashes. I started to count the seconds, but before the sound of the guns had arrived there were four sharp explosions, neatly spaced among the buildings. The corner of one house collapsed and the guns flashed again. I returned inside and remarked that we were perfectly safe as two shells never landed in the same spot, whereupon with a howl one entered the room above my head, passed through the next wall, and burst feebly, slightly wounding a pig. This confirmed my opinion that we were perfectly safe as certainly no three shells were likely to land in the same place, so we sat through the twenty-minutes bombardment in moderate tranquillity. Despite the high injury rate in MMA training, the UFC has never had to cancel an event — until now. Dan Henderson injured his knee, and Jon Jones refused a match with legendary smack-talker Chael Sonnen. This should be obvious to almost everyone: Chael Sonnen is not a light heavyweight, not a striker, and not likely to be able to give Jon Jones any trouble on the feet. This is clearly a hilarious mismatch and it’s actually understandable that Jones would not want anything to do with this fight when it could lower his credibility immediately after signing with Nike. No-one wants to fight enormous mismatches when they are supposed to be proving that they are the best fighter in the world. On the other hand, this match was an absolute gift in terms of publicity. Chael Sonnen has proven one thing over the last three years; that he can talk up a fight which on paper is an enormous mismatch. No-one rated him as having a chance at Anderson Silva in their first bout, in fact many were disappointed at yet another mediocre middleweight title match being put together, but the amount of smack talking Sonnen did made people pay attention. It was the same with the rematch – Sonnen had lost the first bout with Silva the exact same way he had lost almost every other bout in his career but he still managed to make people pay to see the rematch. It is interesting that Sonnen began his smack talk campaign against Jon Jones just days before his former team mate and friend, Dan Henderson dropped out of UFC 151. It is certainly worth considering that at least Sonnen knew about Henderson’s inability to compete long before Jones did. In that respect I can understand where Jones is coming from, he could feel like he has been set up to have his opponent switched at the last minute. What it all comes down to, however, is that almost two dozen fighters on this card have made huge sacrifices, many of them living fight to fight on tight cash, for a card that is now cancelled. Jon Jones directly affected their livelihood and the lives of their families and children by refusing to fight a 185lbs wrestler. It’s understandable that Jones wouldn’t want to risk losing to a middleweight, but that’s exactly what he was risking against Dan Henderson. Jon Jones trained a full camp for a 185lbs wrestler with a huge right hand, and he was asked to fight a 185lbs wrestler with little striking skill or punching power to speak of. When you boil it down to those facts, it’s hard to side with Jon Jones. It bewildered me that Lyoto Machida would take a rematch with so much to work on in his game at such short notice. Lyoto Machida was stopped pretty emphatically by Jon Jones in their last meeting due to Jones’ better wrestling and, more importantly, due to Jones exploiting holes that have always existed in Lyoto Machida’s striking game. The error that Jones exploited in Machida’s striking is not something that can be changed overnight, it is something that Machida has had trained into him since infancy under the karate tutelage of his father. Machida comes from a karate background, and that is what gives him the confidence to back up for a round and a half and then dive in with a counter as soon as the opponent over commits. Machida uses the same counter every time – a straight with whichever hand is his rear hand (he switches stance often).The difference is that Machida’s karate technique is not good boxing technique. When the reverse punch is thrown in karate, the non-punching hand is drawn back to the hip in what is called hiki-te. This represents the act of grabbing an assailant’s clothing and serves no functional purpose in MMA. In boxing the non-punching hand is drawn back to the chin or to above the eyebrow, to deflect an opponent’s punches should he fire back. Machida can get away with pulling his passive hand back to his hip when he is southpaw and his opponent is orthodox due to his head moving outside of their lead hand and being safe from the left hook. What Jones did was to switch to the same stance as Machida, fake a kick to cause Machida to counter, and then connect a rear hook on the side that Machida drops his hand. This was also not a one off event in the fight — Jones hit Machida with a hard rear hook on the jaw in the first part of the second round — showing just how open Machida is to this punch. Clearly Lyoto has been working consciously on making sure his non-punching hand is in position to block Jones’ attempts to counter, but this was just a month ago and he still got clipped by Ryan Bader who is an inaccurate striker for the most part. To take a fight next month with Jon Jones would simply be lunacy when Machida has so much specific work to do on his style and gameplan. Lyoto has the tools to defeat Jon Jones, he demonstrated that in the much referred to first round of their bout, but to rush a title shot would be throwing away what could be his last chance at the light heavyweight crown. I collected images of 76 paintings, sketches, prints, and sculptures of dragons dating from the dark ages to the earliest 20th century, using images available on the internet. The most notable of these include prints of Asian dragons by Totoya Hokkei and Yashima Gakutei, Muslim depictions in Firdawsi’s Shahnama, a sketch by Leonardo Da Vinci, and a diversity of dragon species evident in various works featuring St. George’s dragon, the most famous of which are probably those by the Renaissance master Raphael. Let us imagine a tribe of some 1000 people in some place in ancient times. We could say this tribe had a certain amount of power, based on its wealth and resources. The majority of this power, the control over it, was in the hands of one man — the ruler, the king. He might, in this case, depend on a small cadre of people to assist him, but he largely determined the roles they could play. Let us say, with success and prosperity, this tribe grew to a size of some 10,000. Now, such supreme concentration was too difficult. The ruler would have to bring in others — advisers, generals, high priests. He could keep this number relatively limited and the percentage of power was mostly in his hands, but now ever so slightly diluted. If this town evolved into a city of some 100,000, suddenly there came a qualitative change. The complexity of ruling such numbers grew exponentially. Power at this moment had to be genuinely distributed in order to maintain a sense of control. Now there were teams of ministers, the military, the growing aristocracy and its court. To service this administration, bureaucracies had to evolve. Power remained concentrated, but with a different scale of distribution. We can make three generalizations at this point. When a group of people is given power, it forms a power center. This means, for instance, that a team of military leaders tends to think in two directions — how to promote the interests of the ruler, while also advancing its own agenda. Things now become political, as their interests will clash with other power centers. The ruler must now manage this growing complexity. The power environment becomes increasingly dangerous. Second, once people have been given power on this level, they do not want to give it back or return to an older way of governing. They work to keep what they have and extend their power base. And finally, once power becomes diluted and divided this way, it tends to keep on dividing, like a split atom. More and more people must be brought in to keep the whole functioning. And so over the course of centuries, power slowly became less and less concentrated. Borepatch cites the anarchy of a recent DC beating and the tyranny of a public school principal denying the valedictorian her diploma, because she said hell in her valediction. The Principal and Superintendent are moderately low status positions — petty functionaries responsible for a couple hundred workers — and not even their workers, since the school isn’t their company that they started with their own capital. The result is that we would expect the displays typical for low status officials — this sort of thing, in fact. Compare and contrast to the “Superintendent” of a private school, who is very likely to be the owner of the school. Not only would that person not be so entirely clueless as to the consequences of his actions to his future prospects of prosperity, as a business owner he would likely be considered a medium status official. His signalling will be aimed at differentiating himself from low status officials. The interactions which generate non-normalities in children’s games repeat themselves in real world systems — natural, social, economic, financial. Where there is interaction, there is non-normality. But risks in real-world systems are no game. They can wreak havoc, from earthquakes and power outages, to depressions and financial crises. Failing to recognise those tail events — being fooled by randomness — risks catastrophic policy error. A loyal reader, cursed with the misfortune of being educated outside our American public school system, has asked me for recommendations on books or TV series about our American Revolution. I, cursed with the misfortune of being educated within our American public school system, can’t point to one definitive book but only away from our many textbooks. So, loyal readers, any recommendations? When Poul Anderson‘s grandparents came to the US, they Anglicized their last name from its original Danish spelling of Andersen. Then his parents gave him his distinctively Danish-spelled first name, Poul. After his father’s death, his mother moved the family to Denmark — until World War II. Poul wrote relatively “hard” science-fiction — he started while pursuing his physics degree — and Norse-themed fantasy, which he wrote with Anglo-Saxon wording. In all other unclefts are found other motes as well, about as heavy as the firstbit but with no lading, known as neitherbits. We know a kind of waterstuff with one neitherbit in the kernel along with the firstbit; another kind has two neitherbits. Both kinds are seldom. It is the bernstonebits that link, and so their tale fastsets how a firststuff behaves and what kinds of bulkbits it can help make. The worldken of this behaving, in all its manifold ways, is called minglingken. Minglingers have found that as the uncleftish tale of the firststuffs (that is, the tale of firststuffs in their kernels) waxes, after a while they begin to show ownships not unlike those of others that went before them. So, for a showdeal, stonestuff (3), glasswortstuff (11), potashstuff (19), redstuff (37), and bluegraystuff (55) can each link with only one uncleft of waterstuff, while coalstuff (6), flintstuff (14), germanstuff (22), tin (50), and lead (82) can each link with four. This is readily seen when all are set forth in what is called the roundaround board of the firststuffs. When an uncleft or a bulkbit wins one or more bernstonebits above its own, it takes on a backward lading. When it loses one or more, it takes on a forward lading. Such a mote is called a farer, for that the drag between unlike ladings flits it. When bernstonebits flit by themselves, it may be as a bolt of lightning, a spark off some faststanding chunk, or the everyday flow of bernstoneness through wires. Coming back to the uncleft itself, the heavier it is, the more neitherbits as well as firstbits in its kernel. Indeed, soon the tale of neitherbits is the greater. Unclefts with the same tale of firstbits but unlike tales of neitherbits are called samesteads. Thus, everyday sourstuff has eight neitherbits with its eight firstbits, but there are also kinds with five, six, seven, nine, ten, and eleven neitherbits. A samestead is known by the tale of both kernel motes, so that we have sourstuff-13, sourstuff-14, and so on, with sourstuff-16 being by far the most found. Having the same number of bernstonebits, the samesteads of a firststuff behave almost alike minglingly. They do show some unlikenesses, outstandingly among the heavier ones, and these can be worked to sunder samesteads from each other. Most samesteads of every firststuff are unabiding. Their kernels break up, each at its own speed. This speed is written as the half-life, which is how long it takes half of any deal of the samestead thus to shift itself. The doing is known as lightrotting. It may happen fast or slowly, and in any of sundry ways, offhanging on the makeup of the kernel. A kernel may spit out two firstbits with two neitherbits, that is, a sunstuff kernel, thus leaping two steads back in the roundaround board and four weights back in heaviness. It may give off a bernstonebit from a neitherbit, which thereby becomes a firstbit and thrusts the uncleft one stead up in the board while keeping the same weight. It may give off a forwardbit, which is a mote with the same weight as a bernstonebit but a forward lading, and thereby spring one stead down in the board while keeping the same weight. Often, too, a mote is given off with neither lading nor heaviness, called the weeneitherbit. In much lightrotting, a mote of light with most short wavelength comes out as well. For although light oftenest behaves as a wave, it can be looked on as a mote, the lightbit. We have already said by the way that a mote of stuff can behave not only as a chunk, but as a wave. Down among the unclefts, things do not happen in steady flowings, but in leaps between bestandings that are forbidden. The knowledge-hunt of this is called lump beholding. Some of the higher samesteads are splitly. That is, when a neitherbit strikes the kernel of one, as for a showdeal ymirstuff-235, it bursts into lesser kernels and free neitherbits; the latter can then split more ymirstuff-235. When this happens, weight shifts into work. It is not much of the whole, but nevertheless it is awesome.